You may be familiar with Team Paul Mitchell Karate, but you may not know much about the face behind the group. John Paul DeJoria is a self-made billionaire. He went from homeless to ranking on Forbes “List of Richest Americans,” and he did it all with hard work and dedication. DeJoria was born the son of poor, divorced immigrants. He once worked as a janitor and door to door encyclopedia salesman. He was fired numerous times and faced many challenges that would have destroyed a lesser man. Today, DeJoria runs an empire of about a dozen thriving companies in a variety of industries. In the martial arts world, DeJoria is known as the financial shogun and longtime sponsor of Team Paul Mitchell Karate (TPMK). The team is named after DeJoria’s hair care company, the industry giant, John Paul Mitchell Systems. DeJoria has been the backing behind TPMK for 30 years and is the longest-running known sponsorship in the martial arts throughout the world. DeJoria’s hair care line is thriving and worth an estimated $1 billion in annual revenue. He also has a hand in beauty products, tequila and yachts and employs more than 5,000 people. But despite his wealth and success, he’s a lot like you and me. DeJoria has won some rounds in life and lost a few. He’s been knocked down but always got back up and kept fighting. He also has a deep link to what the martial arts have to offer. Just like many of you, DeJoria is a school owner. Or more factually, the owner of a huge chain of schools. He runs more than 100 schools across the nation where clients are taught to be professionals. So, just like you, he has to concern himself with curriculum, student retention and achieving a reputation to be proud of. 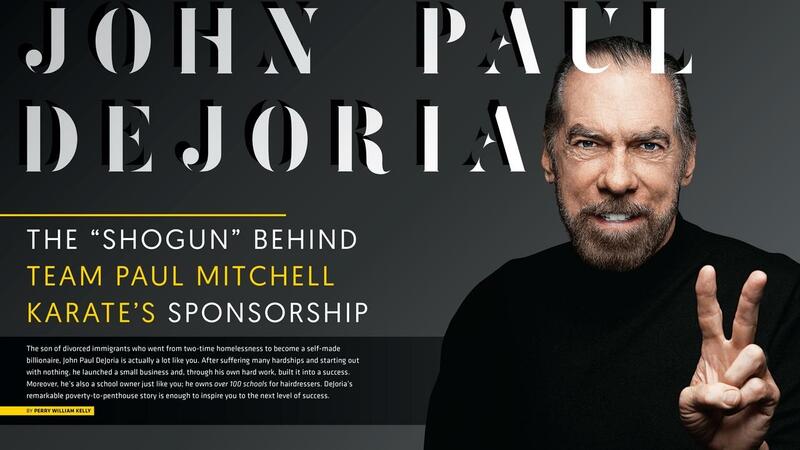 By those standards, John Paul DeJoria is the perfect example of the American Dream. He went to living in a car with is young son to having a net worth of $3 billion dollars and he did it all by working hard and never giving up.